Good morning and Happy New Year from the San Fernando Valley in southern California (home of our P.O. Box) and welcome to the December-January edition of our monthly newsletter, filled once again with good portions of thought-provoking features, all designed to keep our members thinking and gaining insights on the actions that will follow. In this double-feature edition, we highlight two partner organizations of the In2:InThinking Network; the Swiss Deming Institute and the Capital Quality Initiative. We first featured the Swiss Deming Institute in December 2006. Up until now the institute does not offer a formal membership status. However the Institute's most informative website and various other activities have generated a large network of affiliates, which is continuously growing. The website provides information about various aspects of the Deming management philosophy from leading exponents both in German and in English, it regularly offers public an in-house seminars and has started to add subtitles to audiovisual material in order to make it accessible to a multilingual audience. Based on the material collected in our website until now, the staff of the institute is preparing a book scheduled to be published in German during the second half of 2007. Our second partner in this edition is the Capital Quality Initiative (CQI). We first featured CQI in January 2007. The Facts: CQI was started in 1991, merged with Lansing Community College in 1995-1996 and has been part of the college since then. We have individual members ($25 per year); organizational memberships ($150 per year); non-profit 501(c)3 organizations ($50 per year). You can download a membership form on our web site or contact us via phone 517-483-1363 or email Adrian Bass at bassa@lcc.edu. We have a new theme for 2008 - Leading with Quality. We see this as having a double meaning. On the one hand, organizations can apply a focus on quality and quality improvement to lead their organizations forward. Looking at it another way, we hope that organizations will develop leaders who can take them forward in a high quality manner. To this end we will be introducing a Leadership Series for 2008 to share, promote and celebrate the practice and application of quality leadership in our community. Each month we interview members of the In2:InThinking Network to get their perspectives on a variety of questions. This month we asked Scott Lennox (left) and Elaine Johnson (below) to provide their insights. Both have been invited to speak at our Forum in April. In addition, Scott accepted our offer to be our Forum artist this year. His water color print, Live Oaks, adorns the cover of our brochure, as well as the banner at the top of this newsletter. The Facts: I have lived in Fort Worth, Texas most of my life. I currently divide my time between clinical group counseling practice, art, music, poetry, training horses, and occasional invitations to cook on local ranches. I was asked to speak at last year's Forum for a pre-conference workshop and found it a perfect fit with my own style of thinking and social involvement. Working with horses inspires greater and greater congruity--they won't tolerate the lack of it. The "a-ha" has come through letting go of old personal baggage that gets in the way of staying in the present. Learn from the past, look to the future, remain, as much as possible, in the present. Are there any questions that we should add to your member profile? Yes. Who in your life has inspired you most and why? My first true mentor was John Howard Griffin, the author of Black Like Me, who lived here in Fort Worth. He was one America's civil rights pioneers. Apart from his vastly important social consciousness, he remarkably warm and open to constant mental growth. He inspired me to find my own voice, to become a writer and poet, to become a photographer, and to be a better human being. To make his point about the judgement of people by purely superficial indicators, he injected chemicals into his skin to change his color and then wrote about his experience. Those chemicals brought about conditions which eventually took his life. He said to me that it had been worth if American would get the point and stop judging people only by what can be seen on the outside. Griffin knew the true meanings of community, and his willingness to go to such great lengths to help bring about greater equality is a constant inspiration to me. In addition to Scott Lennox, we would also like to introduce our members to Elaine Johnson, a speaker at our 2004 Forum. The Facts: I grew up in Seattle and on Mercer Island at a time when homes were modest, grass and trees covered most of the land, the Lake was clean, jet skiis didn't exist, and sailboats were sovereign. I received a B.A. from Mills College in California, an M.A. from Indiana University, and a Ph.D. from the University of Oregon, where I started teaching when I was 23. My research focused on Shakespeare, John Milton, and 20th-century British and American authors. Today I help educators in K through university and business leaders understand what brain research means for their activities and people. I also teach Advanced Rhetoric and Renaissance literature at Marylhurst, a private Catholic university near Portland, Oregon. Forum Attendance: I have spoken in the past at one Forum meeting and at an annual conference of the Deming Institute. I attend the Forum to renew old friendships, meet new people, and gain new insights. It's all about relationships and new ideas. Tell us about a recent "a-ha" moment: I discovered the joys of an empty nest. Steven Pinker. The Blank Slate: The Modern Denial of Human Nature. Antonio Damasio. Looking for Spinoza: Joy, Sorrow, and the Feeling Brain. Jeffrey M. Schwartz, M.D. and Sharon Begley. The Mind and the Brain. Susan A. Greenfield. The Human Brain. For your brain's sake: exercise, drink lots of water, sleep at least 8 hours a night, eat green and yellow vegetables (especially spinach and carrots), apples, whole grain bread, red meat (yes) and dark chocolate. Research shows that these things really are good for your brain. Alcohol isn't so good-it erases memory. This is the book Myron Tribus describes as "a goldmine of information." The Puritan Gift traces the origins and the characteristics of American managerial culture which, in the course of three centuries, would turn a group of small colonies into the greatest economic and political power on earth. It was the Protestant ethic whose characteristics -- thrift, a respect for enquiry, individualism tempered by a need to cooperate, success as a measure of divine approval--helped to create the conditions which led to America's managerial and corporate success. Thus, the authors contend, the drive, energy and acceptance of innovation, competition, growth and social mobility, all have their origins in the discipline and ethos of America's first wave of European immigrants: the Puritans. And, the authors warn, as Americans distance themselves from core values which produced their nineteenth and twentieth century business and economic successes, they endanger the basis for their prosperity and security. The London-based Financial Times recently selected The Puritan Gift as one of the ten best business books of 2007. "Epic" is a term usually restricted to prose and poetry, seldom to non-fiction books. But, the Puritan Gift may well be classified as an epic as it spans 400 years in search of the roots and development of modern, American management. This is not a book about Deming or Ackoff or Drucker or any other of the familiar names in management thinking. This is a book about the real roots of American Management and how it has evolved through the centuries. This incredibly-well researched book covers the period from 1630 to 2007 in America. The impetus for this book started in the 1940's on Scotland when co-author Kenneth Hopper worked for and was impressed by the American company Procter & Gamble (P&G). This was early in his career in organizations, but the way in which P&G was managed fascinated him. This started a life-long study of how American companies work, how they are managed, and why they are successful. My own beginnings of serious management study began in the 1970's and I have read countless books and articles on business management, but had never read anything so well researched and detailed. I had the distinct pleasure of reviewing a draft of this book and can assure you I have read all 352 pages - at least once. Of the 800 or so books in my library, I have to admit that, except for my Deming books, I doubt I have read more than a few completely from cover to cover. This book was so engaging that I often forgot the red pen and had to go back and re-read sections as a review and not a student. B-schools. For anyone seriously interested in the American management system and how it got to where it is, this is a critical book for their libraries. "The best thing about The Puritan Gift is that it is a real book, full of fascinating insights, intellectual rigour and challenging, authoritative arguments that remind us that there is nothing new about the responsibilities of management." Quoted from Richard Donkins, September 20, 2007. Financial Times. Morgan D. Jones, a retired CIA analyst, presents 14 tools to structure information to solve problems. Analysis is often confused with structure. They are different. Structuring information correctly ensures your analysis will consider only information pertinent to the analysis. No small task when deciding what information is relevant, and how important it is in the larger picture compared to other pieces of information. Recognizing and picking the correct structure is like a carpenter picking the right tool for a task. In part one, Jones lays a sound foundation for why we take shortcuts, how biases impact us, and what makes our thinking susceptible to errors. Part two describes each of the 14 tools. The tools themselves are: (1) Problem restatement, (2) PROs-CONs-FIXs, (3) Divergent Thinking, (4) Sorting, Chronologies and Timelines, (5) Causal Flow Diagramming, (6) Matrices, (7) Decision/Event Trees, (8) Weighted Ranking, (9) Hypothesis Testing, (10) Devil's Advocacy, (11) Probability Tree, (12) Utility Tree, (13) Utility Matrix and (14) Advanced Utility Analysis. And in part three Jones shares a road map of which tool to select when. Jones helps build confidence in the reader with real world exercises taken from newspaper headlines and TV. While we may have been exposed to most of these techniques, the exercises and solutions (at the end of the book) make each tool accessible to anyone committed to improving their skills. I highly recommend this book to any person who is serious about turning his academic knowledge of techniques into practical problem solving ability. This is where this book truly shines. Did Thomas Edison ever make a mistake while pursuing the design of the incandescent light? Or, were these just steps towards the final solution? Once again, it depends on one's perspective. New York Times columnist Alina Tugend commented on the potential mistakes in judging mistakes in a recent article. Follow this link to learn her approach to interpreting mistakes....ones worthy of beginning the year with. Joe Nocera, a business columnist for the New York Times, prepared a recent article with an account of a special gift which almost did not arrive in time for one of his sons to open on Christmas morning. If not for the concept of "Putting Buyers First," he (and his son) would have been very disappointed. Follow this link to read Joe's "delight story" about the organization with a "customer service guy who didn't blink;" a store that left Joe saying, "Why would I ever shop anywhere else online?" Scalpel, Sutures, Clamps, and ??? What was developed in the late 1930's by Boeing test pilots that is today being used to improve care and outcomes in some modern intensive care units? Articles have been published about this method in medical journals such as The New England Journal of Medicine. Hint: it has to do with how we humans grapple with increasing complexity. Chances are, you have used some variation of this method in your work or personal life. It's possible that someone in our Network is alive today because of this method. Here's another hint: it also has to do with managing variation. Interestingly, though this method or practice is accepted and universally practiced in some professions, such as piloting airplanes, people engaged in other professions of similar complexity have been very slow to see the value and give it a try. Another hint: the apparent reluctance to try this method might have something to do with "the right stuff." Read the article [at this link] and let us know what questions occur to you. For example, what deep assumptions or beliefs might your organization hold that prevent it from seeing value, improvement, innovation, "the next level"? usually need major repairs within three to four years," thereby keeping mechanics busy. As for purchase prices, the cheapest Japanese bikes are as much as four times as expensive as the Chinese bikes. All in all, a wonderful reminder of Genichi Taguchi's definition of quality, as "the minimum of loss imparted to society by a product after its shipment to the customer." Perhaps the more expensive Japanese bikes are really cheaper overall. After turning over this column to the ever-able Rick Ladd for our November edition, we return the authorship in this edition to Shel Rovin. To our first-time readers, this column started with an offer to Shel to write a "monthly short, emphasis short, piece as part of the monthly newsletter." Previous editions, plus Shel's agreement, can be found online at this link. Part 2. Nature limits unfettered growth, managers encourage it. Nature controls growth through a variety of mechanisms such as predator-prey relationships, lightning caused forest fires, extinction of species, and environmental change, to name but a few. Organisms are limited in size genetically, and also, for some, because of their environment. Nature is more concerned with development (getting better through natural selection) than growth (getting bigger). In organizations the concern for growth predominates. Bigger is deemed to be better, regardless of the lack of supporting evidence for this sentiment. The data from recent mega- mergers show that with few exceptions industries had a decline in market share as they grew bigger. Reasons given were that the bigger organizations get - the slower they are able to keep up with technologic advances and the more vulnerable they are to competition from narrowly focussed, low cost niche organizations. There is another, perhaps more compelling, reason based on the biologic law that as an animal grows larger the more internal resources are required for its internal functions. But the growth is exponential, not arithmetic. (That's why there are very few extremely large animals) As organizations grow larger the more resources they require for their internal tasks such as communication systems, data gathering, personal interactions and leadership. And like the biologic world this requirement is exponential, not arithmetic. The first law of thermodynamics, the conservation of energy, tells us that energy cannot be created or destroyed-that the intake and expenditure of energy have to balance. This means you have to "give to get." Energy expended in one endeavor means less or no expenditure of energy for another endeavor. Organizations and the people who work in them have a finite amount of energy, not an infinite amount. But that doesn't stop folks from constantly adding to their workloads. One of the more hilarious management slogans is that you have to "do more with less." No one can effectively do more with less, you can only do less with less. As any gardener will tell you, no garden grows without pruning. Regrettably, pulling the plug on something is far more difficult, sometimes painful, than starting something. It is much easier to add a new service or product than to give up an ongoing effort, particularly one with a long history or is cherished or whose existence is politically driven. But organizations cannot thrive or possibly even survive without pruning. The question for people in organizations is: what are we not going to do so we can do what we want to do, i.e., what are we going to give up? A suggestion for improving organizational effectiveness: Add nothing to workloads, product lines, services, without removing a comparable amount of work, products and services. Joanna Macy is the pioneering teacher of the Work that Reconnects, known worldwide in movements for peace, justice and ecological sanity. As an ecophilosopher and trainer she interweaves Buddhism, systems theory, and deep ecology. Building on 4 decades of activism, her ground breaking experiential work brings forth courage and community for the co-creating of a life sustaining society. For more info see: http://www.joannamacy.net/. Fran Macy, director of the Centre for Safe Energy, and co-founder of the US Institute for Deep Ecology, is a cross cultural organiser and trainer, leading the Work that Reconnects in Europe, Asia and North America. For addition information, follow this link. The W. Edwards Deming Institute has announced plans for its second "Deming Immersion Program," a rigorous and intense five-and-a-half day program to deepen understanding of Dr. W. Edwards Deming's theory of management." The seminar includes presentations, simulations, informal discussions, exercises, films, readings, inquiries and homework to enhance participants' learning. Facilitators: Dr. Gipsie Ranney, Dr. Michael Tveite, and Dr. Joyce Orsini, who all learned directly from Dr. Deming and who are referred to in his books. Limitation: This program will be limited to twelve participants. Homework: There will be a pre-seminar homework assignment. Scholarships: A limited number of scholarships are available. Each scholarship covers the seminar fee, hotel for six nights, and all meals during the 5 1/2 day seminar. Follow this link to download the scholarship application. Network members in southern California are well-positioned to attend a play from the life, work and writings of R. Buckminster Fuller that "may change your life!" and will be featured at he Rubicon Theatre in Ventura. Borrowing from the play's website, "Fuller has been called a crank, America's first engineering saint, the Leonardo da Vinci of the 20th century, and the public relations man to the Universe. This tour-de-force performance explores Bucky's life and work through a blend of testimony, lecture, autobiography, poetry, comic antics and video imagery. The play spirals and spins through ideas and experiences, leaving the audience members with their lives placed firmly back in their own laps. L.A. Drama Critics' Circle and Emmy Award-winning actor Joe Spano escorts you on this unforgettable journey." Dates and times: 17 performances, beginning on Thursday January 17th at 8 pm. Follow this link to the play's website for remaining details. To refill or not to refill...water bottles? This is the question on growing number of minds, including, once again, New York Times columnist Alina Tugend. Follow this link to read more of Alina's systemic outlook on the potential dangers of trying to save water bottles from premature burial in landfills and, instead, using them again and again and perhaps one more time. Drinker beware!!! Our Forum planning team is pleased to announce that our doors are open for registration for the upcoming Forum. Follow this link to our website to access our registration survey. We are also pleased to announce that webpages have been created for each of our conference speakers; Steve Cook, Ariane David, Bob Dickman, Gordon Hall, Elaine Johnson, Tom Johnson, Scott Lennox, Richard Maxwell, George Roth, Gipsie Ranney, Shel Rovin, and Ralph Wood. In addition, we have created webpages for all of our 10 pre-conference seminars and workshops and 2 post-conference seminars. Once again, we'll be in Los Angeles. As for pricing, the registration fee for this 6-day event will be $350. This price includes all pre- and post-conference seminars and workshops, conference presentations and activities, materials, and meals (dinner on Friday, continental breakfast on Saturday and Sunday, and lunch and dinner on Saturday). We will also continue a tradition we started this year, offering a discounted registration price of $200 for full-time students in home school, public schools, colleges, or universities. As a reminder, the Ongoing Discussion (OD) for January will feature Russ Ackoff, shown below. On Thursday and Friday, January 24th and 25th, Russ will return for the third time to engage us as the first Thought Leader of the new year. The formal "OD" announcement for Russ's appearance will be released on or before January 21st. and a link to an audio file of an interview with Russ, with a hard copy also available for download. Yes - but! - surely education and how it is managed it is a societal problem. Educationalists, do use their unique talents, but they still have to respond to the demands, restrictions and controls placed on them by Civil Servants as they represent the rest of society. It is employers in the main who demand University "qualifications." When Mr Lambert makes the above statement, does he recognise his and the employers part in the holistic system? 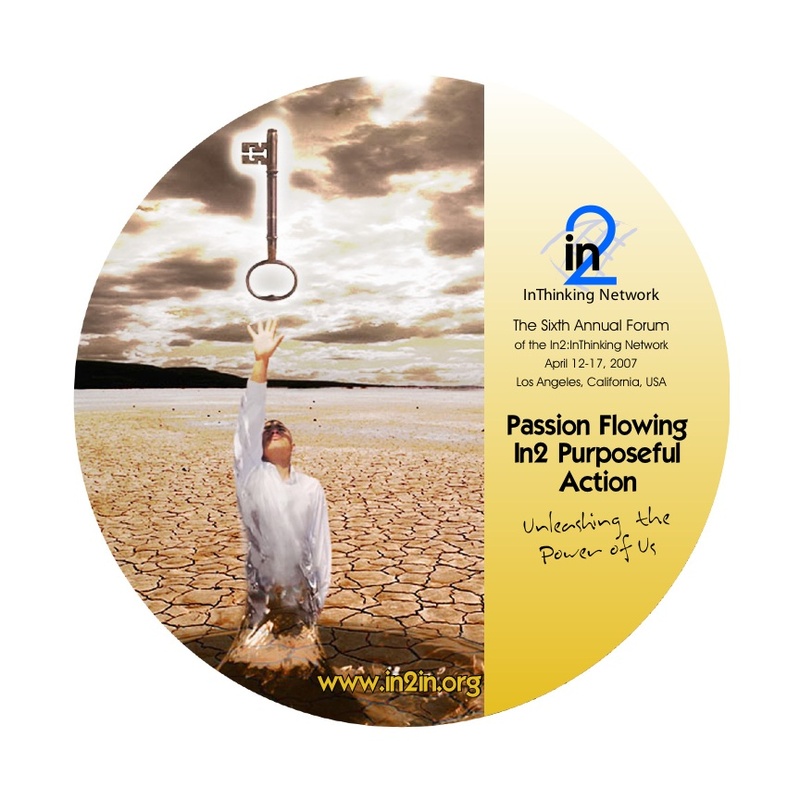 Note: we are proud to announce that Gordon has accepted our offer to appear at our 2008 Forum. His presentation is titled "Can We Build an Organisation's Culture by Design?" For the fifth year in a row, we contracted with Kid Flix, the after-school video services team at Placerita Junior High School in nearby Valencia, CA to videotape our entire (weekend) conference. Once again, a job well done by Paul Kass and his Kid Flix "CREW". Their footage was converted into our final DVD package by Dave Nave & Associates. The package of 10 presentations, including the after-dinner entertainment by taiko group On Ensemble, sells for $150. To order, follow the link from the DVD image above. If you could not join us, here's your chance to find out what you missed. If you attended and want to revisit or share the memories, Dave is ready to fill your order for DVDs from 2005, 2006, or 2007. Members of the In2:InThinking Network are invited by Bob Mason and Clare Crawford-Mason (of managementwisdom.com) to purchase the 4-volume Russell Ackoff video package, "Better Management for a Changing World" at a sale price. These tapes sell for $110 each and are offered for $200 for all 4 in a special offer this month. Follow this link to find information on these videos. Use this link to place your order.